As a certain song would put it: what is a cake with no one to eat it? I have complained, I have belittled, and I have relativized, but never* have I written on this blog about something I cooked and refused to eat. How does one deal with inedible food, and just what is meant by ‘inedible’? I began composing this entry before I made the beet cake. Specifically I planned to write that I began composing the entry before I baked or ate the beet cake that the entry was to be about. I was supposed to then connect this fact to the idea that I tasted the cake before I tasted it--an idea I have been developing (or perhaps only reiterating) in recent entries. But instead the real cake completely collapsed the cake I had imagined (in addition to itself physically collapsing). It went against my expectations in the most extreme way. I couldn’t even manage to eat more than a bite. In preparation to be blogged, the process of creating the cake was photo-documented in detail. You can see the beets being boiled whole, releasing their wine-colored dye into the water. 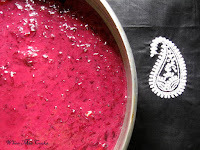 For some reason I decided that, contrary to the recipes I had read, I needed to boil the beets and puree them in a food processor rather than grate them into the cake batter. You can see the deep violet (even violent violet) batter, and the pink frosting. I reserved and then reduced the dyed water that the beets were boiled in, and used this liquid in the buttercream frosting. The reduced liquid had an overpowering taste, but the frosting was both delicious and pretty. You can see that the ‘cake’ that came out of the oven even looked like a cake on the outside, just like the photos from the recipe I didn’t follow. But look inside to see the strange, soggy result. It might be best described as beet puree with other things in it, as opposed to cake with beet puree in it. What you can’t see is that I deliberately omitted sugar from the cake. I wanted to see how sweet a cake only sweetened with beets could be. Also I was motivated by the beet mythology that I established earlier. The beets, I thought, should not be corrupted by their inferior cousin, sugar. My plan was to keep the sugar separate, to load enough sugar into the frosting that the cake would be sweet enough yet the beets would still remain beets. In the end omitting sugar from the cake only made it more disgusting than its texture did already. Earlier I wrote of beets as an antithesis to taste in relation. I treated beets as a taste singularity around which language strains to find adequate comparisons. What happens when a singularity is baked into a cake? It intervenes. When I was carrying them home, the beets stained a library book I had in the same bag. One more beet just fell out of my bag. I had no idea it was still there, lurking. I feel obligated to describe how the turnip was inedible. I’ll go about this in a roundabout way by describing the anxieties that the guide to cooking turnips I found online gave me. While not explicitly saying so, the guide gave the impression that the turnip is a toxic vegetable, similar to, say, cassava. It warned that “turnips tend to have a bitter flavor if not boiled long enough, with at least ONE water change (usually two)! !” I had to extract the bitterness from them by changing the water, twice? Moreover for larger (and therefore more bitter) turnips “it is best to cook them uncovered so the bitter gasses can escape.” They have gasses? What was I trying to do, exorcise a possessed vegetable? If so I was not successful. The cooked turnip smelled nice, but I could not stomach it. It was not an immediate bitterness; it twisted slowly in my mouth, making all food distasteful for the rest of the evening. It was something evil. But I’m willing to believe that the evil can be more completely beaten out the turnip, if not entirely, and that the result would be tasty. I was going to write about the (im)possibility of taste independent of other tastes. This was brought about by the realization that my writing usually peters out into thematic dissonance. Themes may be dissonant, but can they have no relation to one another? Can tastes? Circumstances changed , but I could have just the same written about bad taste (in)dependent of other bad tastes, or good tastes. I could have tried to answer the inane question: does the turnip I didn’t eat constitute a singularity of inedibility? * Except on one occasion. well, at least I feel sated now.